Stockton, CA - The Stockton Ports broke a tie game in the eighth and then held off a Quakes' rally in the ninth, taking the opening game of a three-game series at Banner Island Ballpark on Tuesday night by a final of 5-4. Tied 3-3 in the last of the eighth, the Ports got an RBI hit from Luke Persico and a sac fly off the bat of Luis Barrera to take a 5-3 lead. But the Quakes fought back in the ninth, as Connor Wong singled and Omar Estevez doubled to open the inning, putting the tying runs in scoring postion with no outs against Stockton reliever Angel Duno. Logan Landon followed with a pop-up, before Donovan Casey's RBI groundout scored Estevez to make it 5-4. But with the tying run 90 feet away, Cody Thomas grounded out to end the game, giving Duno his fourth save of the year. 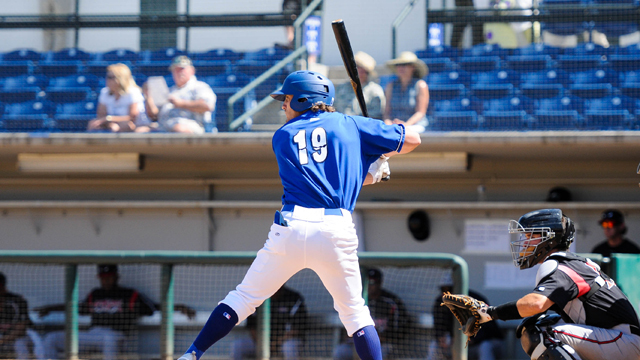 The Quakes got out to an early two-run lead, as Thomas tripled home a pair of two-out runs in the second inning against Stockton starter Matt Milburn. Quakes' starter Tony Gonsolin couldn't hold the lead, as he walked the leadoff batter to open the second and after a Quakes' error, allowed a one-out triple to Luis Barrera, as the Ports tied the game at 2-2. Nate Mondou gave the Ports the lead in the third, as his second round-tripper of the year made it a 3-2 game. That lead held for Stockton until the seventh inning, when Casey tied the game with an opposite-field homer, his second of the year to make it 3-3. Jason Richman (1-4) pitched well, coming on for Gonsolin in the fifth, but the two runs in the eighth were charged to him, as he suffered the defeat. Boomer Biegalski (3-0) earned the win, retiring all five batters he faced in relief. The Quakes (17-22) have now dropped two straight overall and are just 1-6 against the Ports this year, 0-4 at Banner Island Ballpark. Rancho will send Dean Kremer (1-2) to the mound on Wednesday, as he'll be opposed by Stockton's Zack Erwin (2-2) with game time scheduled for 7:10pm. On Friday night, your Quakes return home to LoanMart Field for Cody Bellinger Bobblehead Giveaway, as 1,500 fans will take home a Cody Bellinger Bobblehead, thanks to San Manuel Casino. Tickets are available by calling (909) 481-5000 or online at rcquakes.com. We hope to see you at LoanMart Field very soon...Go Quakes!